West Virginia Tells The Story Of America's Shifting Political Climate : It's All Politics There are few places where Obama is less liked than West Virginia. But for decades, Democrats could count on the state's voters in presidential contests, with only rare exceptions. As Democrats gain from the nation's growing diversity — attracting solid majorities among Hispanic and African American voters — Republicans are gaining among white, working-class voters, a group that was once a Democratic stronghold. About 75 people stand listening, some with signs. There was: "Obama your change destroyed our hope." 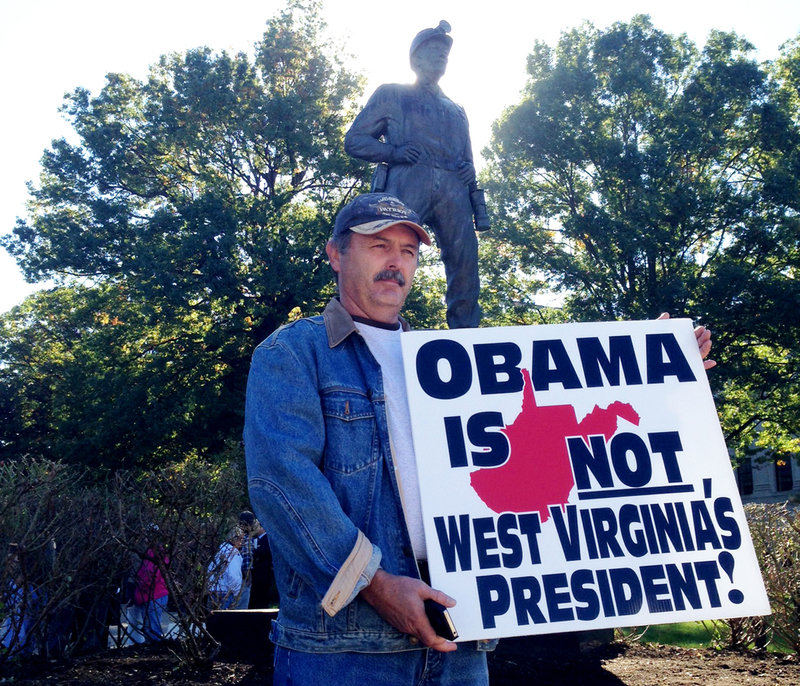 And another that exclaims, "Obama is not West Virginia's president!" Charlotte Kainser, who's married to a retired miner, holds a sign that says "Coal Miners Matter." She shakes her head at the state's worst-in-the-nation jobless rate. "The economy's bad – bad, bad, bad," Kainser says. "So why would you really want to come to West Virginia? Why would you want to live here?" Kainser says she's still a registered Democrat, but one who can't remember the last Democratic nominee she voted for. That's not uncommon. As for this year, she kind of likes Mike Huckabee — and Donald Trump. "My mom called my grandma and told her, 'You'll never believe your grandson just came home registered Republican.' And my grandma was like, 'Well, good job, I voted Republican since Bush's first election,' " he says, even though she was registered as a Democrat. White, working-class Democrats are abandoning the party over environmental issues like coal, and on things like gun rights and abortion. There's been a similar shift among such voters nationally. "For West Virginia, I would say that I feel kind of rock bottom," says the West Virginia University sophomore. "However, my views on the political shift in the country as a whole is it's shifting progressively." "West Virginia is one of those little speed bumps," she says. "But that's the boat West Virginia is in right now." The state may be a speed bump for progressive Democrats, but it's a rising stronghold for Republicans.